The petrified procession of Les Penitents des Mees in the Lure Mountain in the Alpes de Haute in Provence, France. 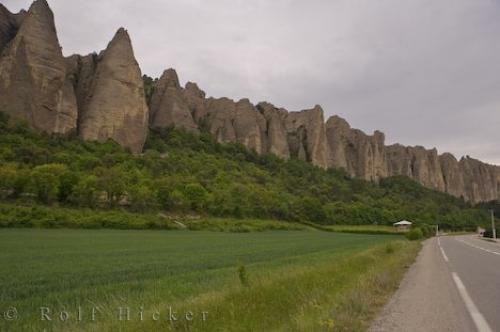 Photo of les Penitents near the village of Les Mees in the Lure Mountain in the Alpes de Haute in Provence, France in Europe. ... The little community at the base of 'les penitents' has a population of around 3000 and was, at one time. a wall-enclosed village. Today, there are just remains of gateways, to remind us of the past, plus of course, the ever-present 'Les Penitents des Mees' looking down from the Lure mountain, in the Alpes de Haute, Provence in France.Les Penitents des Mees, rows of columnar rocks over 100 metres high and over 2 kms long near the village of Les Mees, Alpes de Haute, Provence, France, Europe. I photographed this photo with the digital SLR camera model Canon EOS-1Ds Mark II, aperture of f/6.3, exposure time of 1/80 sec. on ISO 100, as always I used a original Canon Lens, the focus lenght for this picture was 24mm.